The transition to life in Asheville has kept me going full tilt. The cats made it with ease: Sophie helped me drive by sitting in my lap and digging in her claws if I went over 79 mph or changed lanes too quickly and now they are both happy to be here watching the constant cluster of hummingbirds who appeared the moment I hung their feeder. 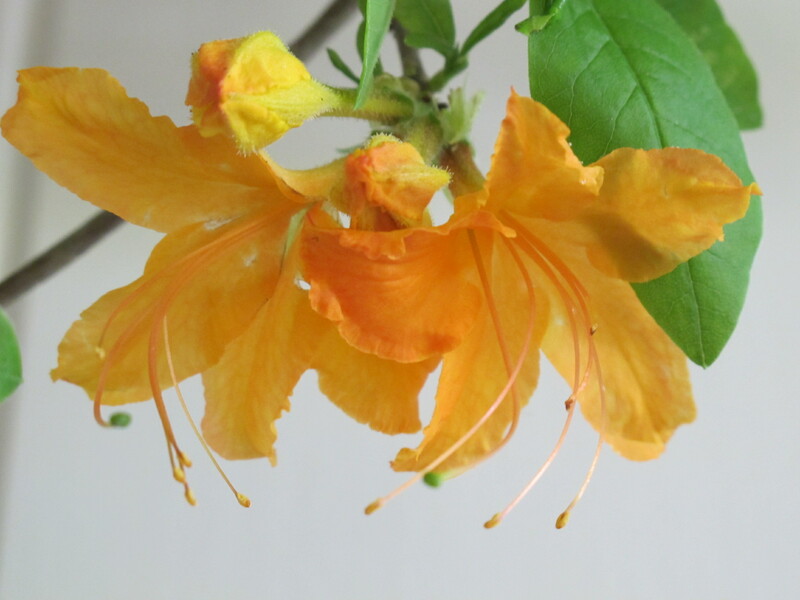 We unpacked two cars worth of stuff, mostly wool, before I sprained my ankle running up and down the mountain ala “Sound of Music.” I love it here and the view from every window is of native azaleas, dogwoods, daffodils, poison ivy…I’m thinking there’s a market for felted bars of Fels Naptha. I could call it Felt Naptha, yes? The first week I rushed to finish some birdhouses for the Grove Park Inn Annual Bird House Competition. 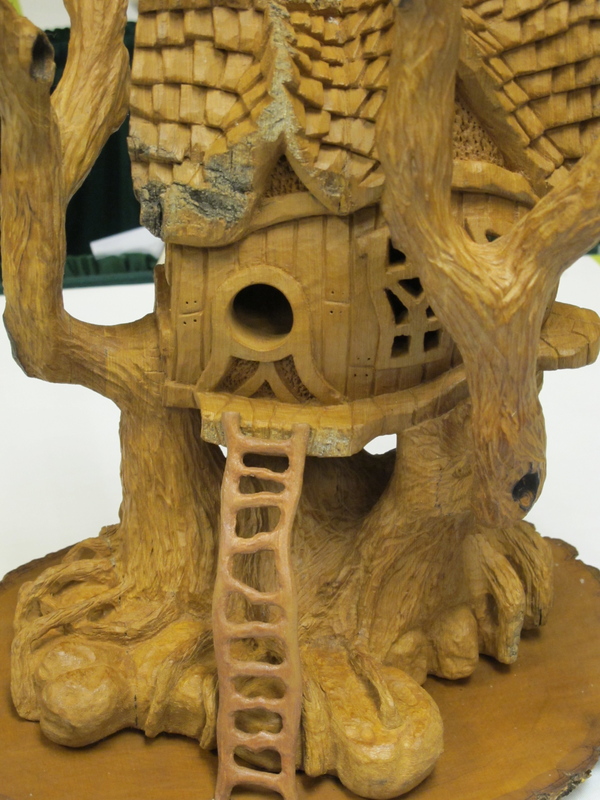 First place went to a master wood carver and his bird house was absolutely fantastic. I was pleased with my entry other than one minor issue that arose the night before during assembly. I had done a series of four barn swallow nests and Rich and I went off in search of a suitable piece of barn siding on which to mount them. It was all completed and just before going to bed I went out to photograph my entry sitting on the dining room table. I was at first annoyed and then alarmed to see ants crawling about and it took less than two minutes to figure out that we had constructed the support base with a termite-infested 4 x 4. Midnight found me in the garage spraying the backside of my artwork with “Mountain Fresh Scent Raid” and gnashing my teeth as an entire colony of winged insects staggered out of a crack in the board. I was thinking that no matter what, Raid smells like Raid but when we delivered it the next day to the competition the woman at the desk exclaimed, “Beautiful! And it smells so nice!” Since then I’ve had a couple of recurring nightmares that the historic arts and crafts era Grove Park Inn is being consumed by termites and it’s all my fault. 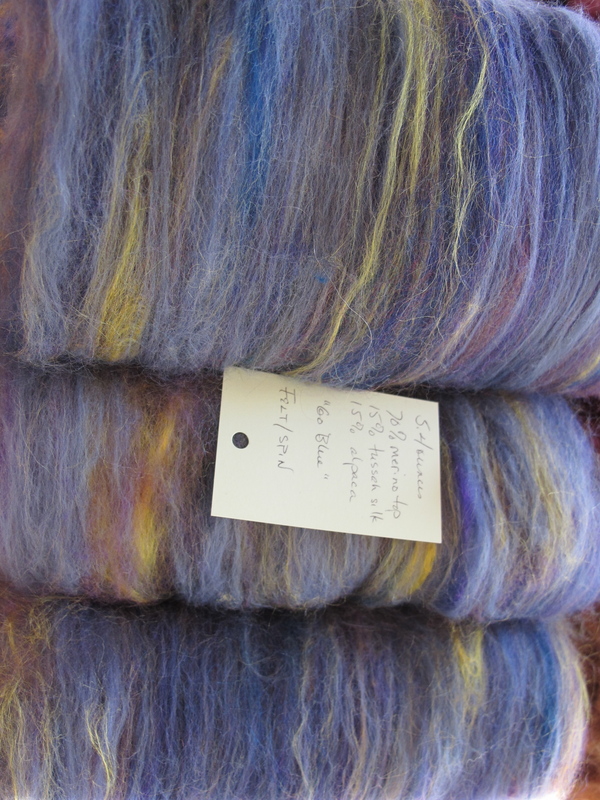 The next big project was to get some felting batts ready to market at Friends and Fiberworks and Asheville Homecrafts. 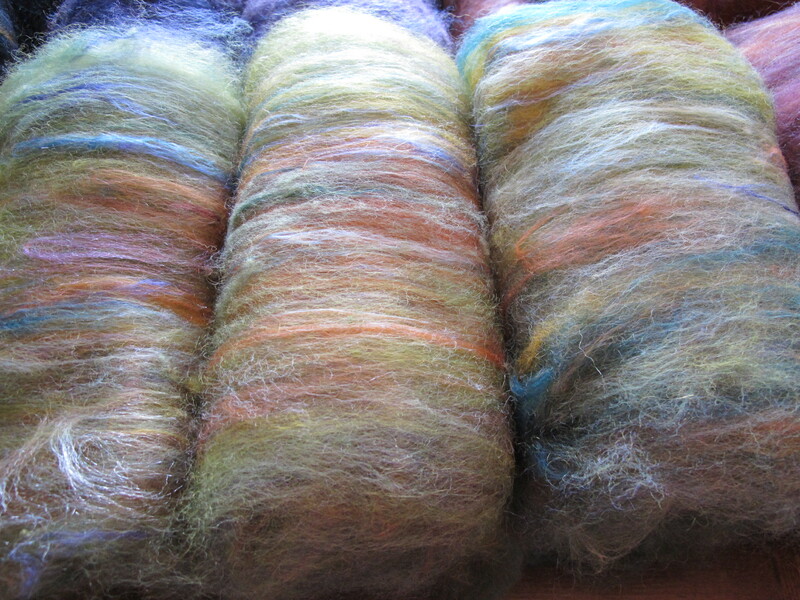 I’m excited that these two great shops are going to be carrying my fibers. I’ve dropped off one big batch and another is being delivered today before I leave for a week to go birding. Rich and the cats will stay here in a house full of wool bunnies; that much drum carding makes a lot of tumblin’ tumblewool and there’s no time to clean before I head out. Birding, you ask? Yes, I am one of those lucky ducks heading for New River, West Virginia for the Birding and Nature Festival. There I will tsay in a farmhouse with some of the best birding bloggers (The Flock) and go on daily birding hikes with some of the nation’s leading ornithologists and biologists. I’ll send a post, with photos of some bird I think you’ve never likely seen. The camera, binocs, knitting, iPad with iBird application downloaded, and rain suit are all packed. New waterproof hiking shoes have been broken in. 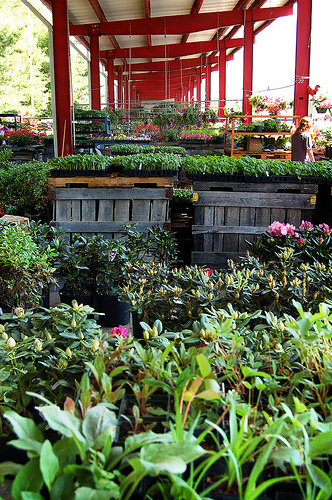 Today is pack, oil change and plant all the herbs purchased yesterday at the Asheville Herb Festival. If I posted more routinely you would see some interesting things here because most of my days on the mountain I encounter new and beautiful things and make great discoveries. Like last night in bed, when I went to fondle affectionately pat Rich goodnight and he squealed, “Don’t give me that poison ivy!” we had a eureka! moment and realized out is was that we are both getting it in exactly the same places, on the bases of our thumbs, near our wrists. This despite constant hand washing, wearing gloves and long sleeves and so forth. It’s those damn cats! They hang out under the deck where there is a lot of the stuff, walking around in it and rolling about and then they come in and nuzzle our wrists for attention and feed, especially as we work on the computers. Sophie, especially, is one to plop down and grab your hand at the wrist and start rubbing and treading. Arghhh. I never thought RoundUp would be in my life but lately I wouldn’t mind winning a enough to clear a football field. Instead of photographing my poison ivy which looks pretty gross, I leave you this image (which some of you have seen on my Facebook page already. 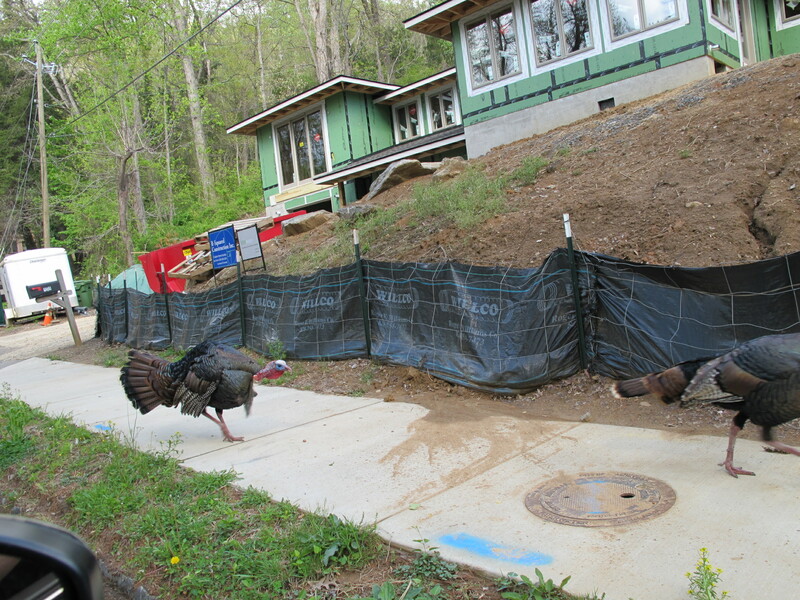 We went into Asheville and these two were “doing it in the street” as my grandmother used to say (referring to hippies, not turkeys) and stopping traffic. We watched for about 3 minutes until someone honked and ruined our fun. But he was determined and chased her down the sidewalk. I’ll put up bird photos and see you on the other side of a week of birds, nature, interesting and learned folks and a whole new adventure. Have a great week at your place.